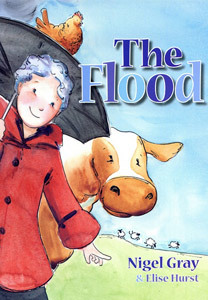 When the farm begins to flood Mrs Farmer has no choice but to let the farm animals inside the house with some very funny results. She ends up with dogs in the kitchen, pigs in the laundry, cows in the dining rom, sheep in the sitting room and hens laying eggs in all sorts of surprising places. When the floodwater recedes she sends them all back outside – but not for long!